One of the things I love most about cooking is that ingredients can be combined in so many different ways to create something so different. 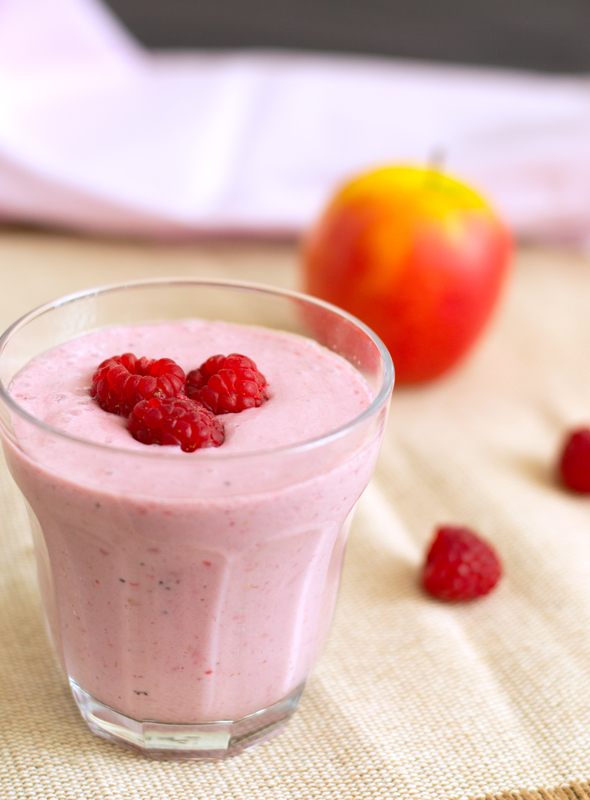 Today I’ve combined two delicious, health-boosting fruits to bring you a delicious, energy-boosting breakfast drink, the ‘Apple Raspberry Smoothie’. Many people shy away from making smoothies, whether they’re for breakfast or a snack, but there are plenty of health benefits. For instance they fill you for longer which means you’re much less likely to snack in-between meals on crisps, chocolate and other unhealthy foods. They also provide you with a convenient way to reach your 5-a-day, or at least more fruit than usual. This recipe is very simple, but that doesn’t mean it’s not complete. The smoothie is fresh and ticks all the boxes health-wise! Enjoy. Combine the ingredients in a blender and blend on a medium setting until smooth. Drink straight away. Delighted to have found your blog! I agree completely — smoothies are an excellent way to incorporate fruit into your daily routine, and if I have a smoothie during the day, I am much less prone to snack on something that isn’t as healthy! My family and I are on a quest to eat healthier — we’re also eating organic and we feel so much better! Look forward to your recipes! Hey Anna, welcome to the blog 🙂 I think that they are some great choices you’ve all decided to make, plus doing it as a family means you’re more likely to stick to it. Let me know how you’re progressing!